Lower right: "J. J. Tissot / 1866"
Costumed in the latest style and surrounded by fashionable decorative objects, the Marquise de Miramon wears a rose-colored, ruffled peignoir, or dressing gown. Around her neck are a black lace scarf and a silver cross. Reflecting the new European fascination with Japanese art, behind her is a Japanese screen depicting cranes on a gold ground, and on the mantelpiece are several pieces of Japanese ceramics. The needlework on the Louis XVI stool indicates that the subject is a noble woman of leisure, and the eighteenth-century terracotta bust suggests her husband's aristocratic heritage. Thérèse-Stephanie-Sophie Feuillant (1836 – 1912) was from a wealthy bourgeois family. She inherited a fortune from her father and in 1860 she married Réné de Cassagne de Beaufort, Marquis de Miramon. She poses in the Château de Paulhac, Auvergne, her husband's family seat. Tissot painted many fashionable women during his career, but he held this work in particularly high regard. In 1866, he wrote to the Miramon family for permission to borrow the painting and submit it to the Paris World Fair, where it was seen in public for the first time. The family kept this letter from Tissot along with a swatch of the Marquise's pink velvet gown. Today, the fabric swatch and the painting are in the collection of the Getty Museum and the letter is part of the collection of the Getty Research Institute. Commissioned from the artist, 1866, by Réné de Cassagne de Beaufort, 5th Marquis de Miramon, French, 1835 - 1882 (Paris), by inheritance within the Miramon family. Heirs of Réné de Cassagne de Beaufort, 5th Marquis de Miramon, French, 1835 - 1882, sold to Blondeau-Bréton. Blondeau & Associés, sold to the J. Paul Getty Museum, 2007. Exposition Universelle de 1867 à Paris, Catalogue Général, exh. cat. (Paris: Palais-royal, 1867). Repr. in Theodore Reff, ed. Modern Art in Paris: Two-Hundred Catalogues of the Major Exhibitions Reproduced in Facsimile in Forty-Seven Volumes (New York: Garland, 1981), p. 44, no. 589. Bellier de la Chavignerie, Émile, and Louis Auvray. Dictionnaire général des artistes de l'école française. 2 vols. (Paris: Renouard, 1885), vol. 2, p. 578. Wentworth, Michael. James Tissot (Oxford: Clarendon Press, 1984), pp. 62-63, fig. 40, app. VI, no. 589. Christian, John. "Tissot's Portrait of the Marquise de Miramon." Christie's International Magazine (September-October 1993), p. 11. Christie’s, New York. 19th Century European Paintings, Drawings, Watercolors and Sculpture. October 12, 1993, unpaginated, no. 42, ill.
Simon, Marie. Fashion in Art: The Second Empire and Impressionism (London: Zwemmer, 1995), pp. 20-22, ill.
De Young, Justine Renée. "Women in Black: Fashion, Modernity and Modernism in Paris, 1860-1890." Ph.D. diss. (Northwestern University, 2009), pp. 270, 392, fig. 5.20. Helvey, Jennifer. Irises: Vincent van Gogh in the Garden (Los Angeles: J. Paul Getty Museum, 2009), pp. 118-19, fig. 59. Groom, Gloria, ed. L'Impressionnisme et la mode, exh. cat. (Paris: Musée d'Orsay, with Skira Flammarion, 2012), pp. 38, 302, no. 21, ill.
Tinterow, Gary. "Édouard Manet, 'Jeune dame en 1866,' dit aussi 'La Femme au perroquet.'" In L'Impressionnisme et la mode, exh. cat. Gloria Groom, ed. (Paris: Musée d'Orsay, with Skira Flammarion, 2012), p. 42. De Young, Justine. "La mode en portraits intimes." In L'Impressionnisme et la mode, exh. cat. Gloria Groom, ed. (Paris: Musée d'Orsay, with Skira Flammarion, 2012), p. 150. Cogeval, Guy, and Stéphane Guégan. "James Tissot, 'Le Cercle de la rue Royale.'" In L'Impressionnisme et la mode, exh. cat. Gloria Groom, ed. (Paris: Musée d'Orsay, with Skira Flammarion, 2012), p. 218n11. Tinterow, Gary. "Édouard Manet: 'Young Lady in 1866.'" In Impressionism, Fashion, and Modernity, exh. cat. Gloria Groom, ed. (Chicago: The Art Institute of Chicago, with Yale University Press, 2012), pp. 26, 29. Groom, Gloria, ed. Impressionism, Fashion, and Modernity, exh. cat. (Chicago: The Art Institute of Chicago, with Yale University Press, 2012), pp. 28, 283, no. 7, ill.
De Young, Justine. "Fashion and Intimate Portraits." In Impressionism, Fashion, and Modernity, exh. cat. Gloria Groom, ed. (Chicago: The Art Institute of Chicago, with Yale University Press, 2012), p. 120. Gleeson, Maura. 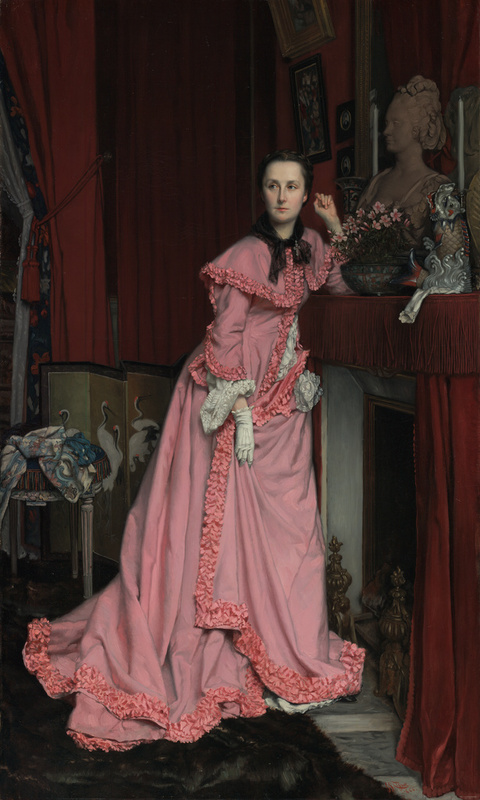 "Fashionable Modernity: Agency and Spectacle in James Tissot's 'Portrait of the Marquise de Miramon.'" M.A. thesis (University of Florida, 2014), passim, figs. 1-1, 2-1, 3-1. Gleeson, Maura. "Fashionable Modernity: Agency and Spectacle in James Tissot's 'Portrait of the Marquise de Miramon'." Athanor 33 (2015), pp. 55-61, fig. 1.